Area II Sports Day Chapter Officer Retreat LEAD Conference Livestock Extravaganza! 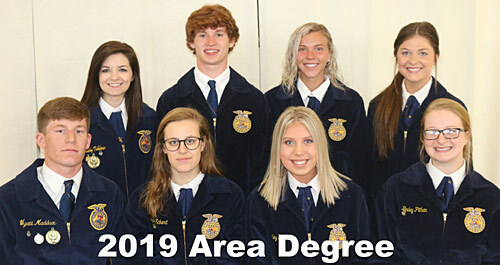 On April 10, 2019, it was announced that 10 members of the Chillicothe FFA received their Area FFA Degree in Chillicothe, MO. Before receiving this degree, they had to meet a number of qualifications and fill out an application that followed their SAE and leadership skills. The Area FFA Degree is the highest degree the Area II FFA Association can give its members. 3. While in school, have completed the equivalent of at least two years (360 hours) of systematic school instruction in agricultural education at or above the ninth grade level, which includes a supervised agricultural experience program. 4. A student after entering agricultural education must have: a. earned and productively invested at least $1000; or b. worked at least 300 hours in excess of class time; or c. a combination thereof, in a supervised agricultural experience program. 7. Have participated in the planning and completion of the chapter Program of Activities. 9. Have participated in at least 25 hours of community service, within at least 2 different community service activities. These hours are in addition to and cannot be duplicated as paid or unpaid SAE hours. 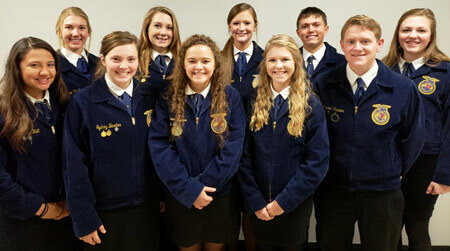 Those from our chapter who received the Area FFA Degree include: Riley Brobst (daughter of Ryan and Stephanie Brobst), Devin Dowell (daughter of Darell and Tamera Dowell), Lindsay Eckert (daughter of Rick Eckert and Mindy Batye), Colten Johnson (son of Casey and Shanna Johnson), Lavey Jones (son of Michael and Nikki Jones), Wyatt Maddux (son of Brian and Heather Maddux), Bailey Pithan (daughter of Joseph and Marcia Pithan), Gabby Tiblow (daughter of Chris and Melissa Feese), and Catey Trout (daughter of Chris Trout and Carey Trout). Congratulations to these individuals on their accomplishments. Cooper & Trace Rardon placed 2nd at the Spring Break 'Um on April 6 at Missouri Trap Shooters Association at Linn Creek, Missouri. The squad scored a 461. 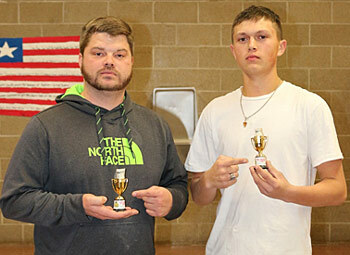 Trap team members that scored 25 straight were Mack Anderson and Dakota Ferrell. On March 26, 2019, the Chillicothe FFA Chapter participated in the Northwest District FFA Contest. The results are as follows: Agricultural Issues 1st place (state) - Macy Gutshall, Matt Hawkins, Brad Hayen, Luke Hopper, Josie Reeter, Dawson Wheeler, Bryce Wolf; Conduct of Meeting 1st place (state) - Chair Clara Leamer, Ellie Barnett, Abby Burton, Abbey Hayen, Selby Miller, Destiney Webb, Gracie West, (Alt) Emmalee O'Dell; Parliamentary Procedure 1st place (state) - Chair Madelyn Wilford, Kennedy Corzette, Rachel Holt, Alayna Mason, CJ Pfaff, Montana Plattner (Alt), Magy Thomas, Caroline Warren; Knowledge Team 1st place (state) - Morgan Biswell, Maggie Churchill, Autumn Eckert, Kyle Young; Prepared Public Speaking Division II - 1st (state) - Seth Hansen, gold - Lucas Campbell; Prepared Public Speaking Division I - 2nd (state) - Josh Eckert; Creed Speaking - 2nd place (state) Claire Ripley. 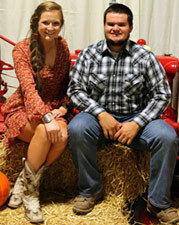 All members advancing to at the State FFA contest will compete in Columbia on April 25 & 26. On April 2 and April 3, 2019, the Chillicothe FFA Chapter participated in the Northwest District Ag Contest. The results are as follows: Agriculture Mechanics 7th place (state) - Drake Bradley, Garrett Cramer, Wyatt Maddux, Colton Peel; Agronomy 14th place - Makenna Campbell, Matney Waters, Seth Hansen; Ag Sales 3rd place (state) - Sydney Baxter, Kaylee Lewis, Maggie Pfaff, Jordan Hopper; Dairy Foods 29th place - Hesston Campbell, Brock Gott, Austin Minnis; Farm Management 2nd place (state) - Jaylyn Broyles, Garrett Cramer, Jessica Moore, Meredith Oesch; Floriculture 29th place - Alaina Thompson, Demarcus Kelo, Quincey Jessen, Miranda Calvin; Forestry 14th place - Kale Campbell, Chase Neptune, Lilly Webb, Morgan Anderson; Livestock 9th place (state) - Mack Anderson, Haley Kidd, Montana Plattner, Clayton Walker; Meats 11th place - Trace Rardon, Gabby Hapes, Chandler Stedem, Tucker Burtch; Nursery/Landscape 10th place - Cameron Dudley, Tyler Hart, Sam Meservey; Poultry 2nd place (state) - Allee Hein, Ethan Hoerr, Emily Miller, Owen Oesch; Soils 13th place - Warren Meservey, Spencer Shira, Connor Keithley, Sheldon Rader. The teams that qualified will be participating at state contest on April 25th and 26th, in Columbia, MO. The following individuals placed in the top ten in their team competitions. Knowledge - Autumn Eckert 5th place, Knowledge - Morgan Biswell 9th place, Farm Management - Garrett Cramer 4th place, Farm Management - Meredith Oesch 9th place, Livestock - Montana Plattner 6th place, Poultry - Owen Oesch 5th place, Poultry - Ethan Hoerr 6th place, Poultry - Allee Hein 7th place, Ag Sales - Kaylee Lewis 4th place, and Ag Sales - Sydney Baxter 7th place. 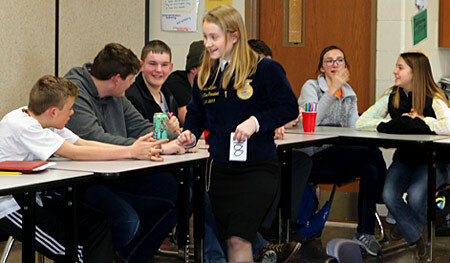 The Chillicothe FFA fielded 16 teams and 4 speakers at District Agriculture and FFA Career Development Events, and 72 Chillicothe FFA members participated in district competition. The career development events were held at Northwest Missouri State University; 313 teams consisting of nearly 1250 students from 55 different schools competed this year. Chillicothe FFA qualified 9 teams, 3 speakers, and 1 book for State FFA Convention. The convention is to be held on the campus of the University of Missouri on April 20 & 21, 2017 in Columbia, MO. The local chapter is part of the Agricultural Education Program at the Grand River Technical School and is composed of students from Chillicothe, Hale, and Southwest high schools. First grade students from Chillicothe Elementary School received a little assistance from the Litton Crusaders at the Litton Ag Campus and the Livingston County Farm Bureau on March 28, 2019. The students learned about plants in class and were given the opportunity to get their hands a little dirty by planting marigold seeds. The project will continue for the next couple of weeks by receiving weekly pictures of the seeds progress until the plants are ready to be transplanted into bigger pots. The students will then come to the Litton Ag Campus and transplant the marigolds into pots and take them home. 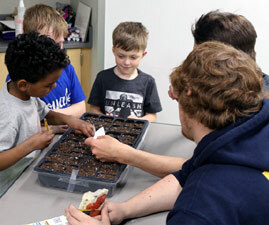 The high school agriculture students assisted first grade students in the planting process. All of the students had a great time. On March 13, 2019, the Chillicothe FFA Chapter participated in the Area II FFA Contest. The speaking results are: Creed Speaker: Claire Ripley - 2nd and gold; Prepared Public Speaking Division I Speaker: Josh Eckert - 3rd and gold; Prepared Public Speaking Division II Speakers: Seth Hansen - 1st and gold, Lucas Campbell - 3rd and gold; Prepared Public Speaking Advanced Division: Riley Brobst - Alternate and gold; Job Interview: Caitlyn Cothern - silver. FFA Books Completed Ownership: Brock Gott - 3rd gold; Completed Placement: Austin Minnis - 3rd gold; Beginning Ownership: Wade Horton - 2nd and gold; Beginning Placement: Carson Crawford - 1st gold; Scrapbook: Mason Baxter, Tucker Burtch, Lucas Campbell, Chloe Funk, Colby Gillespie, Seth Hansen, Connor Keithley, Warren Meservey, Trace Rardon, Tucker Wagers - 2nd and gold. Parliamentary Procedure Team: Chair - Madelyn Wilford, Kennedy Corzette, Rachel Holt, Alayna Mason, CJ Pfaff, Montana Plattner, Magy Thomas, Caroline Warren - 1st and gold; Conduct of Meetings: Chair - Clara Leamer, Ellie Barnett, Abby Burton, Abbey Hayen, Selby Miller, Destiney Webb, Gracie West, Alt - Emmalee O'Dell - 2nd and gold. Those teams and individuals receiving 3rd place or higher will proceed to District competition March 26, 2019, in Cameron, MO. Shelby Davies, Missouri State Vice President, talks to a group of Litton Agriculture Education Center students on Thursday, February 21, 2019, at the Litton Agricultural Education Building. She talked about what students could learn by being involved in the FFA organization and conducted leadership games with the students. Shelby is one of 16 Missouri State FFA Officers. 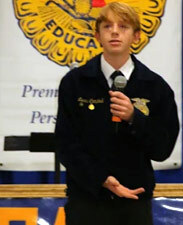 His home chapter is the Braymer FFA Chapter. National FFA Week was an exciting, eventful week at the Chillicothe FFA Chapter! The National FFA Organization was established in 1928; and since its establishment, the organization has flourished. Over the last year, the number of national members has grown by more than 20,000; these members can be found within the 8,360 different chapters that spread across all 50 states. National FFA Week gives the 669,989 FFA members a chance to express their passion for the FFA. In our community, FFA week is dedicated to promoting agriculture and thanking farmers as well as other agriculturist. Our FFA Week celebration began on Friday, February 15th, when our chapter partnered with the Chillicothe Chamber of Commerce to host the annual Salute to Agriculture Breakfast. Sunday, February 17th, our chapter was supposed to attend Faith Baptist Church in Utica, Missouri, for a morning service, but due to our famous Missouri weather, slick roads caused us to miss that event. Due to no school on Monday, February 18, we picked up the spirit of National FFA Week on Tuesday with dress-up spirit days. The dress-up days were: Tuesday - Camo Day (Salute to Veterans Day), Wednesday - Denim on Denim and/or Flannel Day (Salute to Farmers Day), Thursday - Dress like an Ag Teacher Day (Salute to Ag Education Day), and Friday - Official Dress (Salute to FFA Members Day). On Tuesday, all members also wrote letters to local veterans to thank them for their service to our country. Wednesday, all members wrote letters to local farmers to thank them for producing a healthy safe food supply. Thursday, members wrote letters to Missouri ag teachers to thank them for supporting and promoting agriculture. Along with thank you notes and spirit days, the Chillicothe FFA conducted a coloring contest for elementary students to participate in, as well as presented high school faculty and staff with a gift of appreciation. 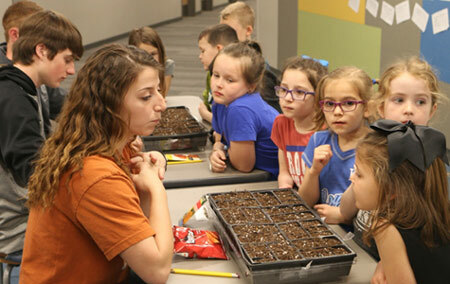 Although National FFA Week was full of exciting activities, this week taught today's youth about the importance of agriculture and agriculture education. Our FFA Chapter is very thankful for all the community does, not only during FFA Week, but year around. 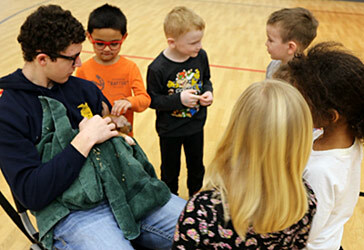 Students from Chillicothe Elementary School pre-kindergarten, kindergarten and first grade classes participated in a hands-on learning experience on February 22, 2019. The Litton Crusaders and the Livingston County Farm Bureau made this visit possible as part of the Thank A Farmer program. The students learned about habitats and animals with assistance from the Litton Crusaders program. 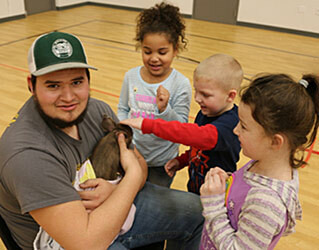 The students handled a baby pig and learned a little about them from the high school students. 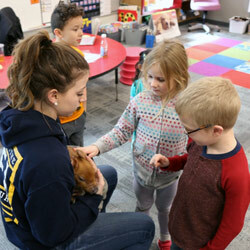 During the visit, students learned about their pig's gender, name (ear notch), breed, what they eat, and whatever other questions they came up with. Later on in the school year, the students will take a field trip to the Litton Agriculture Campus and revisit those baby pigs as market hogs. 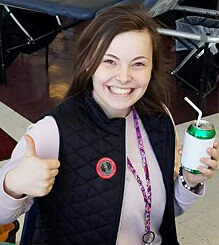 On Friday, February 1, 2019, the FCCLA and FFA sponsored a blood drive for high school students and staff at the Chillicothe High School Performing Arts Center. 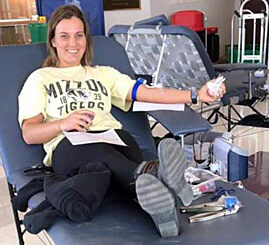 The Community Blood Center staff registered 31 volunteers and collected 15 units of blood. The FCCLA and FFA members assisted the Community Blood Center staff with set-up, registration, passing out treats, and clean-up. 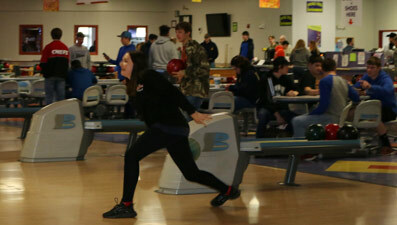 On February 3, 2019, the Chillicothe FFA held their annual Bowling Party at the Fast Lane Entertainment Center in Chillicothe. This party represents a reward for members as well as a time for fellowship. There were approximately 93 members present; and everyone seemed to enjoy the afternoon. Over 4500 first year FFA members from more than 320 Missouri High Schools had the opportunity to learn about being positive role models, learning to get involved, making sound choices, becoming active team members and making a positive difference in their lives, school and community at the annual Greenhand Motivational Conferences. These conferences presented by the State FFA Officers and sponsored by MFA Incorporated were held January 7-11, 2019, throughout Missouri. 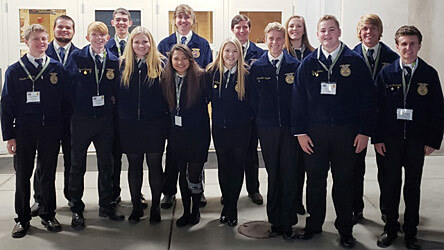 Chillicothe FFA Chapter sent 75 Greenhand FFA members to attend the conference which was held on the NCMC Campus on January 10, 2019. 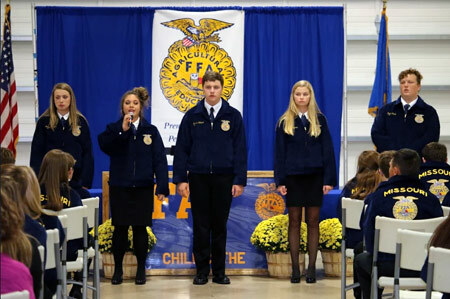 Through interactive workshops and skits, the State FFA Officers encouraged first-year FFA members to explore their talents and reach outside their comfort zone for the opportunities provided through FFA membership. They helped the new agriculture students set goals for their education, careers, and FFA experience. 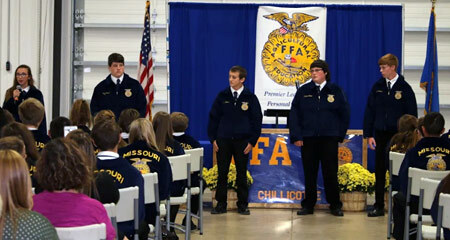 The State Officers of the Missouri FFA Association recently conducted 19 Greenhand Motivational Conferences in Missouri. MFA Incorporated helped sponsor the conferences. Seated from left to right in the front row are: Past Secretary Sydnee Mason, Marshall; Vice President Audrey Martin, Meadville; Vice President Quentin Carlyle, East Prairie; President Paxton Dahmer, Nevada; Vice President Adriene Aubuchon, Owensville; and Vice President Madison Bader, Hermann. 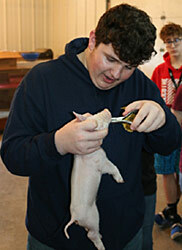 Picture - Ag Science I student, Landon Baker, is clipping needle teeth from senior FFA member, Kaylee Lewis', baby pig. 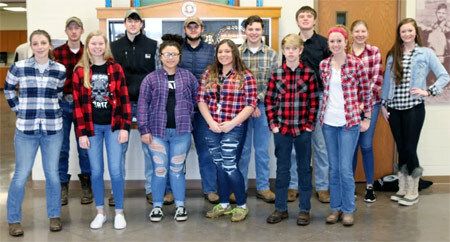 Students from the Ag Science I and Animal Science classes at the Litton Agriculture Education Center enjoyed a hands-on learning experience at the Litton Agri-Science Learning Center during January. The students learned about animal reproduction in class and then experienced the real thing in person. While at the Litton Ag Campus, the students gave the newborn baby pigs an iron shot, notched ears, clipped tails, and cut needle teeth. During first semester, the students were in charge of charting the heat cycle, expected pregnancy date, name of sire, and day of artificial insemination for some of the sows housed at the Litton Agri-Science Learning Center. Nearly 120 years ago, two compassionate sisters in Kansas City set out to provide the best medical care possible to all children in their community regardless of the family's ability to pay, and they knew they would need the community's support to do it. The founding sisters wrote a list of needs on a chalkboard in front of the hospital. Neighbors rallied to help, and the hospital grew. Generous communities continue to provide for patients and their families by donating goods needed during their time in their care. Every gift to Children's Mercy is a gift of love, healing, and hope for kids in need. This year, the Chillicothe FFA Chapter chose to raise money to donate to Children's Mercy Hospital. Members raised $1000 during their December chapter meeting to make blankets and give a monetary donation to the hospital. 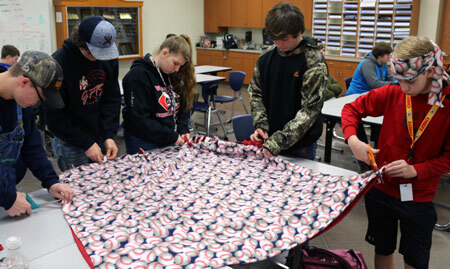 Students made 53 fleece blankets during class for patients at the hospital. The assistant officer team took the $300 monetary donation and 53 blankets to the hospital on December 19, 2018, and received a tour of the hospital. On December 12, 2018, the Chillicothe FFA held their annual Christmas Party at the Chillicothe Middle School. This party represents a reward for members on an excellent Barnwarming this year and is a time for fellowship. The members enjoyed dinner and then moved into the field house for some games. 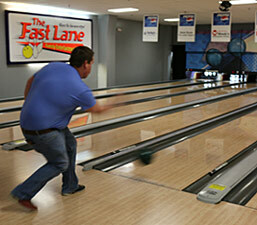 Members could play basketball, corn hole, volleyball, or participate in other activities. The winners of the 3-on-3 coed basketball tournament were first place Mack Anderson, CJ Pfaff, and Maggie Pfaff; second place Kale Campbell, Ethan Hoerr, Chase Neptune, Matney Waters, and Lilly Webb; third place Tucker Burtch, Brooke Horton, and Spencer Shira. The winners of the corn hole tournament were first place Mr. Martin and Matt Hawkins; second place Josie Reeter and Madelyn Wilford; third place Nick Heldenbrand and Wade Horton. 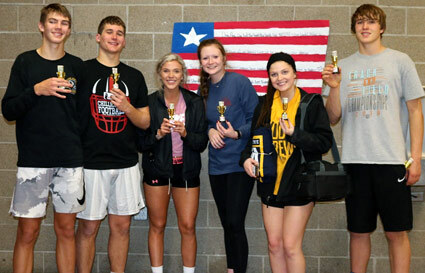 The winners of the coed volleyball tournament were first place Mack Anderson, Devin Dowell, Kaylee Lewis, CJ Paff, Catey Trout, Jaden Winder; second place Abby Burton, Abbey Hayen, Demarcus Kellow, Clara Leamer, Gage Leamer, and Selby Miller; third place Tucker Burtch, Lucas Campbell, Makenna Campbell, Brooke Horton, Connor Keithley, Sheldon Rader, Trace Rardon, Chandler Stedem, and Lilly Webb. The students also held a drive to raise funds to make blankets to donate to Children's Mercy Hospital. There were approximately 165 members present; and everyone seemed to enjoy the evening. 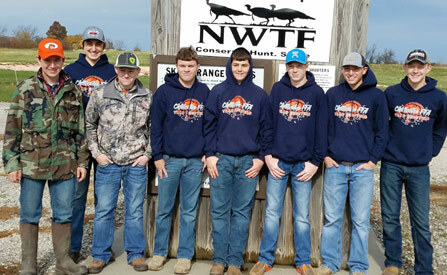 On December 8, 2018, the Chillicothe FFA Chapter attended the area trap shoot held at the Trenton Trap Range. The first place overall team was the Chillicothe team. The students enjoyed the day and learned a lot about competition. The Chillicothe FFA Chapter had 6 teams/23 individuals shoot on Saturday: Ethan Cooper A-41, Drake Bradley A-26, Clayton Walker A-44, Mack Anderson A-43, Garrett Cramer A-40, Trace Rardon A-42, Kale Campbell B-30, Bryce Wolf B-29, Dakota Ferrell B-35 Tucker Burtch B-39, Morgan Anderson C-33, Sam Meservey C-38, Hunter Woodcock C-33, Brock Gott D-31, Malloree Summers D-34, Keegan Valbracht D-35, Matt Hawkins D-26, Sullevin Diegelman D�30, Brooke Horton D-35, Josh Meservey E-20, Carson Crawford F-17, Landon Baker E-28, Owen Oesch C-36, Randy Plattner (FFA Advisor), Tony Burtch (volunteer coach), John Cramer (volunteer coach) and Brice Walker (volunteer coach) who traveled to Trenton. Chillicothe Team A received first place, Team C received fifth place, Team D received fourth, and Team B received sixth (tie) in the team competition. Individuals with top 10 honors overall were 2nd Clayton Walker, 3rd (tie) Mack Anderson, 5th (tie) Trace Rardon, 8th Ethan Cooper, and 9th (tie) Garrett Cramer. Individuals with top five honors in the female division were 2nd Brooke Horton and 3rd Malloree Summers. The members of the team are looking forward to more events. 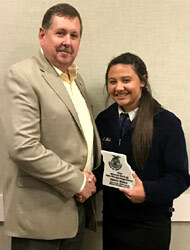 JEFFERSON CITY, MO - Kaylee Lewis, of Chillicothe, won first place in the Missouri Farm Bureau (MOFB) FFA Speech Contest and was presented a plaque, a $150 award, and $150 for her chapter by MOFB Vice President Todd Hays. 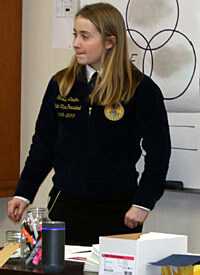 Kaylee placed first in the Northwest District FFA speech contest to compete at the state level. Lewis presented her speech a second time before several hundred Farm Bureau members during the Sunday evening program. The contest was part of Farm Bureau's 104th annual meeting December 2, 2018 at the Lake of the Ozarks. Farm Bureau supports the FFA Public Speaking Contest in its efforts to nurture the leadership qualities of future spokespersons for agriculture. The contest gives participants a better understanding of Farm Bureau and how the organization works for Missouri agriculture. Those participating in the contest include the top winner in each of six district competitions. All cash awards are provided by the Missouri Farm Bureau Foundation for Agriculture. Olivia Brune, of Eolia, placed second. Other FFA members placing in the top six were: Emily Whipple of Windyville, Emma Hurst of Jefferson City, Aubrey Jung of Perryville, and Westin Wilson of Ava. 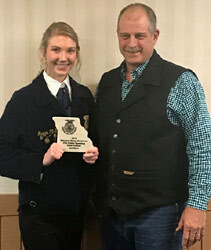 The 2018 Missouri Sheep Producers State FFA Speaking contest was held at Tan-Tar-A Resort on Sunday December 2. The contest is designed to develop individual public speaking skills and to promote interest in and awareness of the many different aspects of the sheep industry. Participants earned the right to compete at the state contest by winning their respective district competitions. District winners included: F South Central - Makysha Spencer, Summersville FFA; North East - Alania Link, Moberly FFA; and Southeast - Audrey Lutmer, Dexter FFA. Results of the competition were as follows: First Place - Isabelle Fox, Mt Vernon FFA; Second Place - Kendra Dunham, California FFA; Third Place - Maggie Pfaff, Chillicothe FFA. Ed DeOrnellis, MSP representative and Chairman of the event presented each of the participants a plaque and check from MSP. The 2018 Missouri Teach Ag State FFA Speaking contest was held at Tan-Tar-A Resort on Sunday, December 2. The contest promotes Ag Education, encourages students to consider a career in Ag Ed, recruits potential teachers, and emphasizes the importance of agricultural educators. 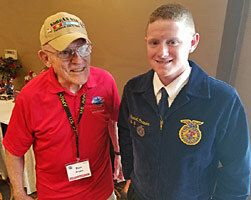 This year's topic was Ag Educators: Strengthening Agriculture. 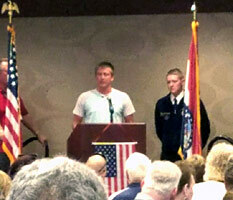 Speeches were to be 6-8 minutes in length and required students to interview a current or retired FFA Advisor. 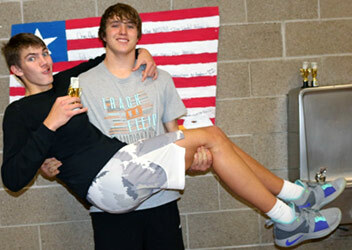 Participants earned the right to compete at the state contest by winning their respective district competitions. District winners included: Rachel Holt - Chillicothe, Kiersten Helm - Lexington, Laney Moore - Southwest. Results of the competition were as follows: 1st - Ricki Spargo - Naylor, 2nd - Jacob Knabel, Fatima, and 3rd - Logan Westmoreland, Columbia. 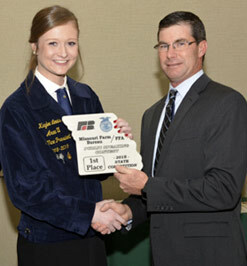 Leon Busdieker, State FFA Advisor , presented each of the participants a plaque and check. 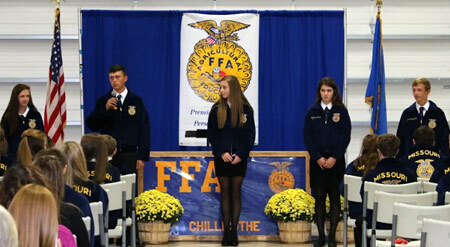 On November 7, 2018, Chillicothe FFA students participated in the Area II Fall Speaking Contest in Gallatin. Kaylee Lewis competed in the Missouri Farm Bureau Contest, Madelyn Wilford competed in the Missouri Pork Producers Contest, Sydney Baxter competed in the Missouri Institute of Cooperatives, Rachel Holt competed in the Missouri Teach Ag, Matt Hawkins competed in the Missouri Soil and Water Conservation, Montana Plattner competed in the Missouri Cattleman's, Maggie Pfaff competed in the Missouri Sheep Producers, Macy Gutshall competed in the Missouri Pet Breeders, Josie Reeter competed in the Missouri Quarter Horse, and Garrett Cramer competed in the Missouri Young Farmers speech contest. Kaylee, Madelyn, Matt, Rachel, Macy, Maggie, Josie and Garrett moved on to the district competition on November 14, 2018. On November 14, 2018, Chillicothe FFA students participated in the Northwest District Fall Speaking Contest in Cameron. Kaylee Lewis competed in the Missouri Farm Bureau Contest, Madelyn Wilford competed in the Missouri Pork Producers Contest, Rachel Holt competed in the Missouri Teach Ag, Matt Hawkins competed in the Missouri Soil and Water Conservation, Maggie Pfaff competed in the Missouri Sheep Producers, Macy Gutshall competed in the Missouri Pet Breeders, Josie Reeter competed in the Missouri Quarter Horse, and Garrett Cramer competed in the Missouri Young Farmers speech contest. Garrett received 2nd place in the the Young Farmers competition. Kaylee received 1st place in the MO Farm Bureau competition, Rachel received 1st place in the MO Farm Bureau competition, and Maggie received 1st place in the Missouri Sheep Producers competition. All 1st place winners will compete at the state level on December 2, 2018, in Lake Ozark, MO. 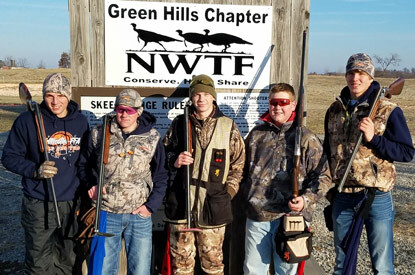 On November 3, 2018, the Chillicothe FFA Chapter attended the area trapshoot held at the Trenton Trap Range. The first place overall team was the Chillicothe team. The students enjoyed the day and learned a lot about competition. The Chillicothe FFA Chapter had 6 teams/24 individuals shoot on Saturday: Ethan Cooper A-46, Drake Bradley A-35, Clayton Walker A-44, Mack Anderson A-46, Garrett Cramer A-45, Trace Rardon A-43, Kale Campbell B-25, Bryce Wolf B-39, Dakota Ferrell B-31, Tucker Burtch B-42, Morgan Anderson C-39, Sam Meservey C-41, Chase Neptune C-37, Wade Horton C-39, Hunter Woodcock C-29, Brock Gott D-37, Malloree Summers D-30, Keegan Valbracht D-29, Matt Hawkins D-27, Sullevin Diegelman D�36, Josh Meservey E-23, Spencer Cairns F-16, Gage Labaw F-20, Carson Crawford F-32, Randy Plattner (FFA Advisor), Tony Burtch (volunteer coach), John Cramer (volunteer coach) and Brice Walker (volunteer coach)/that traveled to Trenton. Chillicothe Team A received first place, Team C received fourth place, Team D received fifth, and Team B received eighth in the team competition. Individuals with top ten honors overall were 1st (tie) Mack Anderson, 1st (tie) Ethan Cooper, 3rd Garrett Cramer, 4th (tie) Clayton Walker, 6th (tie) Trace Rardon, 9th (tie) Tucker Burtch and 10th (tie) Wyatt Maddux. An individual with top five honors in the female division was 2nd Malloree Summers. The members of the team are looking forward to more events. Students from all the Kindergarten classes and Preschool at Chillicothe Elementary School were having a hands-on learning experience at Papa Charlie's Pumpkin Patch on October 25 & 26, 2018. The students learn about agriculture in the classroom through their regular curriculum and assistance from the Litton Crusaders program. During the school year, students will learn all about animals on the farm, crops grown on the farm, and what farmers provide to the general population. As part of the Litton Crusaders' program students were given the opportunity to go to Papa Charlie's Pumpkin Patch for a farm experience with a little fun mixed in. 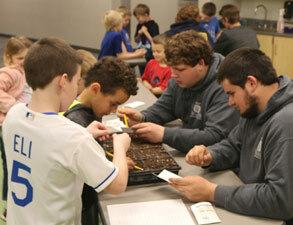 High school students (24 students) from the Litton Agriculture Education Center assisted in the days' activities. The students were able to pet several animals in the petting zoo, visit with "Curly" the pig, see some longhorn cattle in their nature habitat, walk through a corn field, take a hayride, pedal a tractor, and get up close to hay bales. On Saturday November 3, 2018, the Chillicothe FFA held its annual Barnwarming festivities. These festivities included a dance, games, and the coronation ceremony. This year's 2018 Barnwarming King and Queen are seniors Drake Bradley and Kaylee Lewis. The Senior class candidates Kaylee Lewis (Clint and Angela Lewis) and Drake Bradley (David and Tracy Bradley) raised $9,746.00 with an average of $256.47/person; the Sophomore class candidates Chloe Funk (Larry and Brenda Funk) and Connor Keithley (Chad and Betsy Keithley) raised $10,206.00 with an average of $159.46; the Freshman Class candidates Selby Miller (Greg and Carrie Miller) and Gage Leamer (Matt and Brooke Leamer) raised $11,266.00 with an average of $150.21; the Junior class candidates Josie Reeter (Jamie and Julia Reeter) and Hesston Campbell (Clint and Kathy Campbell) raised $5,497.00 with an average of $125.00. In total, the chapter raised $36,715.00 this year for the chapter's operations which averaged $166.13/member. We would like to thank all the members of the community for the long-time support of our organization. 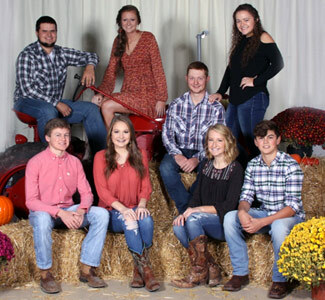 September 7, 2018 - The Chillicothe FFA has selected its King and Queen Candidates for the 2018 Barnwarming. These individuals will lead the charge in the fund raising efforts of the Chillicothe FFA members. The FFA members are now available to do your odd jobs around the house and farm. Give them a call, and they will organize a work team to help you in your fall cleanup activities. The class that averages the most money per member will have their candidates crowned King and Queen on November 3, 2018, at the annual Barnwarming Dance. The candidates are as follows: Seniors, Kaylee Lewis (Clint and Angela Lewis) and Drake Bradley (David and Tracy Bradley); Juniors, Josie Reeter (Jamie and Julia Reeter) and Hesston Campbell (Clint and Kathy Campbell); Sophomores, Chloe Funk (Larry and Brenda Funk) and Connor Keithley (Chad and Betsy Keithley); Freshmen, Selby Miller (Greg and Carrie Miller) and Gage Leamer (Matt and Brooke Leamer). The chapter has set a goal to raise $30,000 this year for chapter operations. If you have any type of job, please give an FFA member a call or call one of the advisors at the Litton Agriculture Campus at 660-646-3131. On October 24 through October 27, 2018, 14 members of the Chillicothe FFA Chapter attended the National FFA Convention in Indianapolis, IN. The students attended many activities while in Louisville. The students attended leadership sessions, the career show, college fair, and convention sessions while at the convention hall. Students also attended a session hosted by speaker Kyle Scheele - speaker, author and cardboard builder; a concert featuring Garth Brooks and Ned Ledoux, Dr. Jim Wand - hypnotist, and a little fun go-carting. Local members who attended the convention were Mason Baxter, Drake Bradley, Jaylyn Broyles, Tucker Burtch, Lucas Campbell, Macy Gutshall, Seth Hansen, Rachel Holt, Connor Keithley, Warren Meservey, Trace Rardon, Chandler Stedem, Keegan Valbracht, and Madelyn Wilford. During the 91st National FFA Convention, 16 members of the Chillicothe FFA Chapter were awarded their American FFA Degree, the highest degree a member can receive in the organization and only given to 1% of membership. Our chapter had the 3rd highest number of degrees by a single chapter (see below). Almost any event becomes more intriguing when viewed from behind the scenes. The 91st National FFA Convention, which includes everything from arena stage events to the Day of Service and workshops for nearly 65,000 attendees, is no exception. It takes many volunteers to help make a convention of this magnitude a positive experience for all of its guests. This year, approximately 900 FFA members, including students from the Chillicothe FFA Chapter, formed the National FFA Courtesy Corps. The students viewed the convention from the other side - backstage - playing a crucial role in the events logistics. Chillicothe members assisted at the Cinch World's Toughest Rodeo flag ceremony and ticket collection. Local members participating in the National FFA Courtesy Corps were Mason Baxter, Drake Bradley, Jaylyn Broyles, Tucker Burtch, Lucas Campbell, Macy Gutshall, Seth Hansen, Rachel Holt, Connor Keithley, Warren Meservey, Trace Rardon, Chandler Stedem, Keegan Valbracht, and Madelyn Wilford. "Participants in the National FFA Courtesy Corps provide valuable services for the overall convention operation," says National FFA Advisor Dr. Steve Brown. 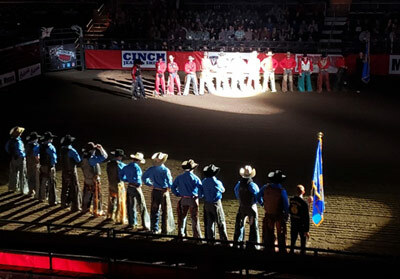 "FFA gains a tremendous resource, and the participants gain wonderful volunteer experience and an insight into the planning and logistics necessary to ensure a safe and successful convention. They are key to our ability to create a premier leadership and educational event for nearly 65,000 guests." 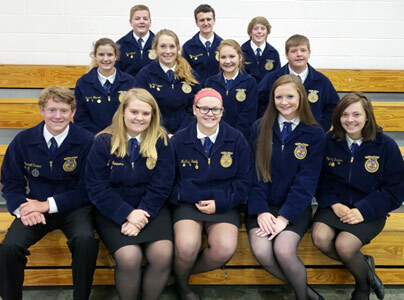 INDIANAPOLIS - The Chillicothe FFA chapter of Chillicothe, MO, has been recognized in 2018 National Chapter Award Program from the National FFA Organization. The program recognizes outstanding FFA chapters from throughout the country that actively implement the mission and strategies of the organization. These chapters improve chapter operations using the National Quality FFA Chapter Standards and a Program of Activities that emphasizes growing leaders, building communities and strengthening agriculture. Chapters are rewarded for providing educational experiences for the entire membership. Chapters that received star ratings during judging July 22-27 and were recognized at the 2018 National FFA Convention & Expo, Oct. 24-27 in Indianapolis. All star FFA chapters receive honors made possible by corporate sponsor John Deere. "Feeding some 9 billion people by mid-century brings with it unprecedented challenges for today's farmers," said Amy Allen, manager, national corporate contributions for John Deere. "The skills and experiences learned though the National Chapter Award Program will help meet the critical needs." Indianapolis, IN - Each year, the National FFA Organization honors FFA members who show the utmost dedication to the organization through their desire to develop their potential for premier leadership, personal growth and career success through agricultural education. The American FFA Degree is bestowed up on a select group of students in recognition of their years of academic and professional excellence. This year, 4,255 American Degrees will be awarded. Brady Bothwell the son of Barrie & Julie Bothwell, Sheridan Guilford the daughter of Stewart & Sandy Willis and Brett & Andrea Guilford, Cole Gutshall the son of Bill & Angie Gutshall, Hunter Haakonstad the son of Scott Haakonstad and Kim Haakonstad, Kristina Hamilton the daughter of Randy & Ann Hamilton, Kyle Hansen the son of Kevin & Bobbi Hansen, Ben Jones the son of Dwight & Renee Jones, Emma Leamer the daughter of Michael & Natalie Leamer, Jared Loney the son of Nelson & Lesli Loney, Sarah Mason the daughter of Bill & Shawn Mason, Kaylee Peel the daughter of Aaron & Alcy Peel, Kade Plattner the son of Randy & Anna Plattner, Rylee Reeter the daughter of Gail Reeter and the late Ron Reeter, Taylar Simmer the daughter of Shawn & Kelli Simmer, Zach Trout the son of Chris & Carey Trout, and Madelyn Warren the daughter of Doug & Laura Hughes and the late Scott Warren all received the American FFA Degree at the 91st National FFA Convention in Indianapolis on Saturday, October 27, 2018. It is the highest degree awarded by the National FFA Organization only given to 1% of FFA membership and recognizes demonstrated leadership abilities and outstanding achievements in agricultural business, production, processing and service programs. FFA members who qualify for the American FFA Degree: Have received the State FFA Degree, have been an active member for the past three years (36 months) and have a record of satisfactory participation in the activities on the chapter and state level. Have satisfactorily completed the equivalent of at least three years (540 hours) of systematic secondary school instruction in an agricultural education program or have completed at least the equivalent of 360 hours of systematic secondary school instruction in agricultural education and one full year of enrollment in a postsecondary agricultural program or have completed the program of agricultural education offered in the secondary school last attended. Have graduated from high school at least 12 months prior to the national convention at which the degree is to be granted. Have in operation and have maintained records to substantiate an outstanding supervised agricultural experience program through which the member has exhibited comprehensive planning and managerial and financial expertise. A student after entering agricultural education must have: (a) Earned at least $10,000 and productively invested $7,500 or (b) Earned and productively invested $2,000 and worked 2,250 hours in excess of scheduled class time. Any combination of hours, times a factor of 3.56, plus actual dollars earned and productively invested must be equal to or greater than the number 10,000. Hours used for the purpose of producing earnings reported as productively invested income shall not be duplicated as hours of credit to meet the minimum requirements for the degree. Have a record of outstanding leadership abilities and community involvement and have achieved a high school scholastic record of "C" or better as certified by the principal or superintendent. Have participated in at least 50 hours of community service within at least three different community service activities. These hours are in addition to and cannot be duplicated as paid or unpaid supervised agricultural experience hours. Each recipient of the American FFA Degree receives a gold American FFA Degree key and a certificate after being recognized on stage at that national convention. 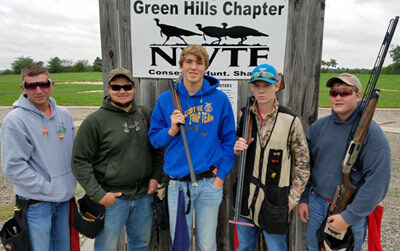 On October 13, 2018, the Chillicothe FFA Chapter attended the area trap shoot held at the Trenton Trap Range. The first place overall team was the Chillicothe team. The students enjoyed the day and learned a lot about competition. 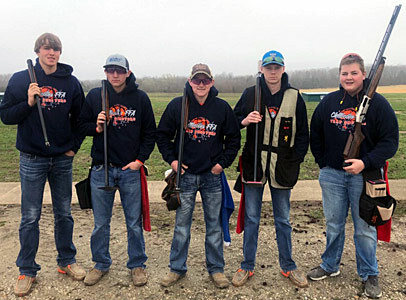 The Chillicothe FFA Chapter had six teams/28 individuals who shot on Saturday - Ethan Cooper A-45, Drake Bradley A-42, Clayton Walker A-39, Mack Anderson A-44, Garrett Cramer A-44, Trace Rardon A-47, Wyatt Maddux-B 41, Kale Campbell B-28, Bryce Wolf B-27, Dakota Ferrell B-39, Tucker Burtch B-45, Morgan Anderson C-43, Sam Meservey C-39, Chase Neptune C-39, Wade Horton C-29, Hunter Woodcock C-29, Brock Gott D-40, Malloree Summers D-34, Keegan Valbracht D-29, Matt Hawkins D-32, Brook Horton D-34, Sullevin Diegelman D�24, Landon Baker E-18, Josh Meservey E-20, Spencer Cairns F-18, Gage Labaw F-15, Carson Crawford F-28, Nick Greenslate F-8, Randy Plattner (FFA Advisor), Tony Burtch (volunteer coach), John Cramer (volunteer coach) and Brice Walker (volunteer coach) who traveled to Trenton. Chillicothe Team A received first place, Team B received third, Team D received fourth, and Team C received fifth place in the team competition. Individuals with Top 10 honors overall were 1st Trace Rardon, 2nd (tie) Ethan Cooper, 2nd (tie) Tucker Burtch, 4th (tie) Garrett Cramer, 4th (tie) Mack Anderson, 6th Morgan Anderson, 7th (tie) Drake Bradley and 10th (tie) Wyatt Maddux. Individual with top five honors in the female division were 1st (tie) - Malloree Summers and 1st (tie) - Brook Horton. The members of the team are looking forward to more events. 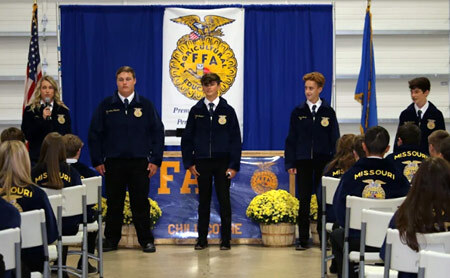 On October 3, 2018, the Chillicothe FFA held their annual Parents' Night, where 364 members and guests attended. This event welcomes the first year FFA member and their parents to our organization and showcases some of our members' talents. The evening began with FFA opening ceremonies followed by a motivating welcome given by Garrett Cramer, Chillicothe FFA President, as well as a school district welcome given by Dr. Roger Barnes, Chillicothe R-II School Superintendent. The Chillicothe FFA Chapter officers and Chillicothe FFA Assistant Officers presented the program. The program consisted of the Greenhand FFA Degree ceremony, Chapter FFA Degree ceremony, a creed, as well as five creeds presented by Greenhands. The creed was presented by the following Greenhands Miranda Ball, Ellie Barnett, Abby Burton, Maggie Churchill, Ethan Cooper, Carson Crawford, Joshua Eckert, Josh Gault, Konner Gilson, Matt Hawkins, Abbey Hayen, Allee Hein, Ethan Hoerr, Quincey Jessen, Clara Leamer, Gage Leamer, Selby Miller, Emmalee O�Dell, Owen Oesch, Christian Peniston, Claire Ripley, Destiney Webb, Brooke Williams, Kyle Young, and Aiden Zimmerman. The Greenhands received their FFA jacket as well as their Greenhand Degree pin. The Chapter Degree recipients received their Chapter Degree pin. 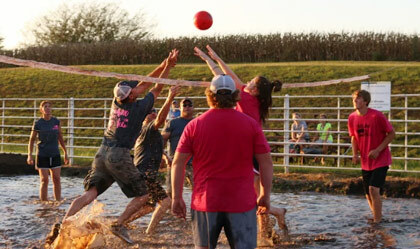 On September 19, 2018, the Chillicothe FFA Chapter held its fifth annual Mud Volleyball Tournament. 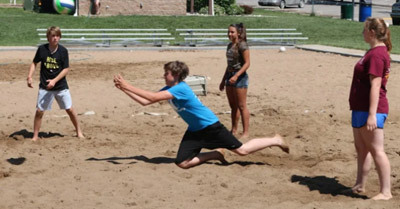 The tournament consisted of 26 teams with a double elimination event. There were 320 members and spectators present at the tournament with pork burgers and chips provided for all. 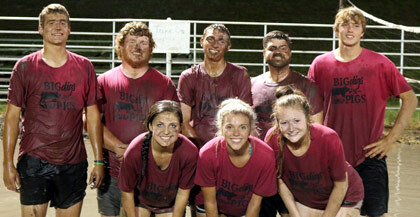 The team members consisted of FFA members, FFA alumni, parents, and staff. The tournament was held to encourage a fun atmosphere for freshman members to become more acquainted with upperclassmen as well as fuel a little friendly competition. A freshman parent meeting was also held to assist parents with learning the workings of their child joining FFA. This year, members decided to assist their fellow FFA members who have been affected by the hurricane. The following local businesses sponsored a pit during the tournament. Those businesses were: Trans Ova Genetics, BTC Bank, FCS Financial- Mitzi Winder Crop Agent, Sydenstricker John Deere- Chillicothe, Pro Harvest - Mike Resor and DQ Precision Tillage & Planting - George Quinn. Each team also paid an entry fee to play. All proceeds from the event will go to those affected by the drought in Missouri. The tournament raised $750 for those in need. This year's winning team was the Big Digs & Show Pigs which consisted of Mack Anderson, Devin Dowell, Brock Gott, Kaylee Lewis, Lance Martin, Catey Trout, Clayton Walker, and Jaden Winder. 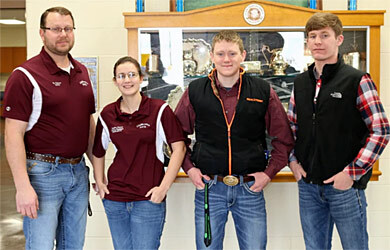 The second place team was Beef Cakes (Trans Ova Genetics) which consisted of Britney Adam, Matt Bartlett, Sam Graves, Evan Kempker, DeWayne McCauslin, and Stanton Warren. 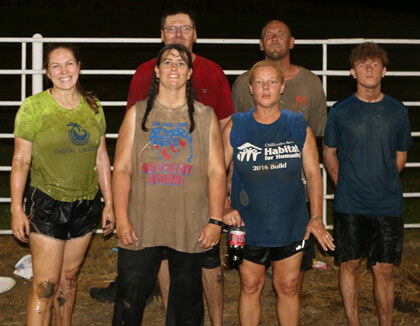 The third place team was the Mud Bunch which consisted of Samantha Figg, Betsy Hoerr, John Lamp, Angila Vance, Ben Vance, and Caleb Vance. The members would also like to thank the parents who helped prepare food as well as the parents and staff who participated in the tournament. 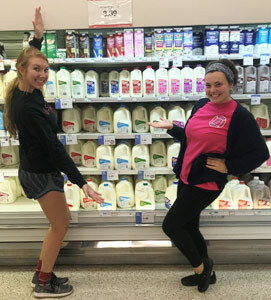 The Chillicothe FFA Chapter recently participated in the "10-gallon challenge" to benefit both dairy farmers and needy families. 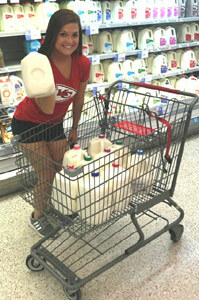 The challenge is simple - just head to your local grocery store, buy ten gallons of milk, and then drop them off at your local pantry. The challenge was conceived by farm broadcaster Ty Higgins, who created a video that's been viewed tens of thousands of times. Higgins says he empathizes with the struggles that dairy farmers are facing today. "Dairy farmers right now are in the worst position they've been in in years, and so he asked himself "How can I help them?" While there's an oversupply of milk on the market, at the same time, many food pantries are in need of milk. So, the challenge is a win-win. 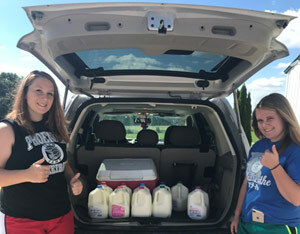 Chillicothe FFA members purchased the milk from our local Hy-Vee and then delivered it to the House of Prayer. On September 8, 2018, the Chillicothe FFA Chapter attended the area trapshoot held at the Trenton Trap Range. The first place overall team was the Chillicothe team. The students enjoyed the day and learned a lot about competition. The Chillicothe FFA Chapter had 6 teams/26 individuals shoot on Saturday: Ethan Cooper A-42, Drake Bradley A-38, Clayton Walker A-43, Mack Anderson A-44, Garrett Cramer A-47, Trace Rardon A-41, Wyatt Maddux-B 29, Kale Campbell B-40, Bryce Wolf B-33, Dakota Ferrell B-36, Morgan Anderson C-39, Sam Meservey C-34, Chase Neptune C-37, Wade Horton C-39, Hunter Woodcock C-33, Brock Gott D-41, Malloree Summers D-38, Keegan Valbracht D-28, Matt Hawkins D-35, Brook Horton D-33, Sullevin Diegelman D�28, Nick Heldenbrand E-21, Landon Baker E-19, Josh Meservey E-10, Spencer Cairns F-16, Gage Labaw F-25, Randy Plattner (FFA Advisor), Tony Burtch (volunteer coach), John Cramer (volunteer coach) and Brice Walker (volunteer coach) /who traveled to Trenton. Chillicothe Team A received 1st place, Team B received 9th, Team D received 5th, and Team C received 4th place in the team competition. Individuals with top five honors overall were 1st (tie) Garrett Cramer, 3rd (tie) Mack Anderson, 7th (tie) Ethan Cooper, 10th (tie) Brock Gott, and 10th (tie) Trace Rardon. Individuals with top five honors in the female division were 1st - Malloree Summers and 2nd - Brook Horton. The members of the team are looking forward to more events. Ian Bennett, National FFA Southern Region Vice President, talks to a group of Litton Agriculture Education Center students on Friday, August 31, 2018, at the Litton Agricultural Education Building. Ian talked about what students need to do to help them set and accomplish goals, as well as how to be a good communicator while working with others. 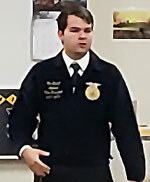 Ian is one of six National FFA officers. 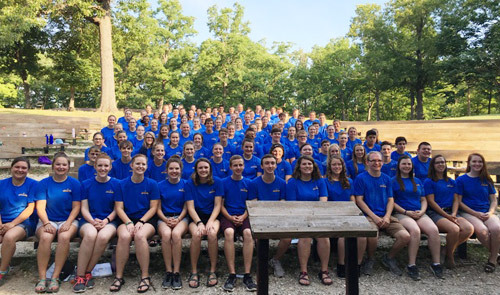 Missouri's top 30 FFA high school seniors completed the fourth annual Helping Youth Prepare for Excellence (HYPE) FFA Academy June 26-28, in Columbia, Mo. The three-day intensive program is designed to inform and empower students to effectively engage on pressing agriculture topics. Since 2015, the Missouri Corn Merchandising Council has sponsored and facilitated the academy in conjunction with Missouri FFA. This year's academy was hosted at the University of Missouri's College of Agriculture, Food and Natural Resources. Garrett Cramer from the Chillicothe FFA Chapter was one of the thirty FFA members in attendance. "The HYPE program is a solid investment in the future of our industry," said Missouri Corn Merchandising Council Chairman Mark Scott of Wentzville. "I am impressed with FFA members every time I am around them, and this academy is no exception. It shows young people what goes into agriculture as a whole; it is not just growing crops or raising cattle. The legislative side is key and can have a great impact on the industry." Over the three days, students participated in sessions promoting advocacy training, social media, communication and stakeholder collaboration. In addition, topics included overcoming adversity, developing a personal brand and engaging those with opposing viewpoints. Students learned from farmers, industry representatives, social media experts and others on how to effectively advocate about issues facing the industry. The group explored the Missouri Soybean Association's Bay Farm and its innovations in crop production, research and soybean biotechnology. In culmination, participants testified on key issues during mock hearings with legislators at the Missouri State Capitol. This year's topics included tariffs and trade, the 2018 Farm Bill, lab-produced meat labeling, a Foot and Mouth vaccination bank, and an E15 Reid Vapor Pressure (RVP) approval. Missouri Sens. Brian Munzlinger (R-Williamstown) and Caleb Rowden (R-Columbia) and State Reps. Sonya Anderson (R-Springfield), Rusty Black (R-Chillicothe), Jay Houghton (R-Martinsburg), Deb Lavender (D-Kirkwood), Hannah Kelly (R-Mountain Grove) and Tracy McCreery (D-St. Louis) interacted with and challenged the students. Missouri Director of Agriculture Chris Chinn concluded the academy by empowering participants to use their newfound skills as they continue to represent Missouri�s number one industry. The Missouri Corn Merchandising Council is an organization of corn growers dedicated to developing and expanding corn markets, educating growers and customers and exploring new research opportunities. The National FFA Organization makes a positive difference in the lives of students by developing their potential for premier leadership, personal growth and career success through agricultural education. Kaiser, MO - Connor Keithley, a member from the Chillicothe FFA Chapter, attended the 6th Annual HYMAX Academy from June 15-June 17, 2018. HYMAX (sponsored by the Missouri FFA Association) was held at Camp Rising Sun located within the Lake of the Ozarks State Park. The academy provided extensive leadership training for 100 high school students who are members of FFA across Missouri every year. 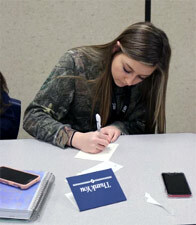 The high school sophomore students were selected out of many applicants to attend this Agricultural Advocacy academy. They were trained by MO State FFA officers as well as past MO State FFA Officers, Agricultural Educators, Teach Ag Ed Ambassadors, and MO FFA State Staff. 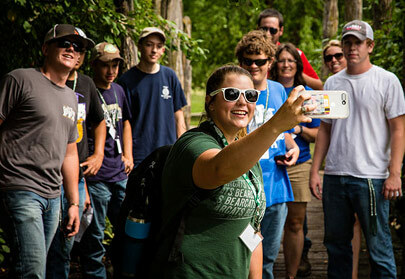 Students learn how to advocate for agriculture, strengthen their Supervised Agricultural Experience, and develop their communication and personal leadership skills. The National FFA Organization makes a positive difference in the lives of students by developing their potential for premier leadership, personal growth and career success through agricultural education. 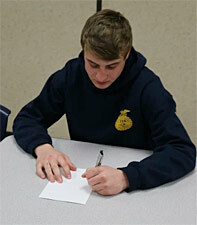 Nationally, there are over 500,000 FFA members. Missouri ranks 4th in the nation with over 25,000 FFA members. 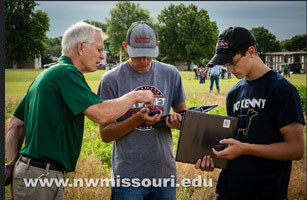 From handheld GPS units to auto-guided tractors and remote-controlled Segways, a select group of high school students and agriculture educators got hands-on experience with the future of the industry this week as Northwest Missouri State University hosted the third annual AgriVision Equipment Group Precision Agriculture Summer Academy. The three-day summer academy held June 19-21st incorporates hands-on activities with state-of-the-art equipment and networking with industry professionals to advance the knowledge of students and agricultural educators in precision agriculture technologies. Students explore precision application, remote sensing, geographic information systems and data collection and management in the agriculture field. "With the ever-changing technology in agriculture, it exposes not only the high school students to that technology, but it exposes the ag teachers as well, and that's important because they can take it back into the classroom," Rod Barr, the director of Northwest's School of Agricultural Sciences, said. "We're exposing students to the latest technology, and they take it back to their school and make a difference in the industry." Twenty-four high school students who recently completed their sophomore and junior years and are active members of a 4-H club or FFA chapter were selected to participate along with their agriculture teachers. Participants receive a scholarship that covers the cost of lodging, food, materials, supplies and tuition. Northwest agriculture students also played an active role in the summer academy, mentoring and leading groups of students through activities. 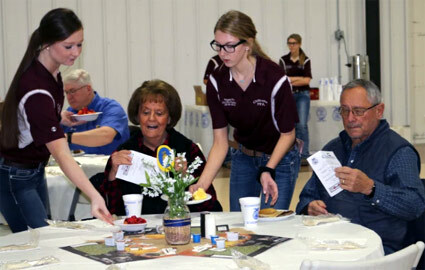 Holly Hatfield, a junior from Kirksville, Missouri, who is majoring in agriculture education, agronomy and horticulture, was among those Northwest students. "It's important to get high school students on campus because it provides them the opportunity to think about coming to Northwest," said Hatfield, who didn't grow up on a farm but developed her passion for agriculture by participating in her local FFA and 4-H groups. "AgriVision has supplied us with everything we need to teach them that this is an opportunity. This is a place they can come and learn and a place they can return and work for the future of agriculture." 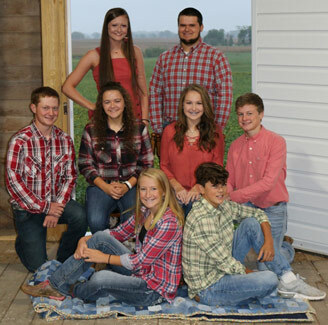 James Shughart, an agriculture teacher at Harlan Community School in Iowa, said he appreciated the opportunity to learn farming trends and methods that he can take back to his classroom, and his students may then apply those things on their family farms. "It gives me different opportunities to take back to my students in the classroom, and it gives them chances to have hands-on immersion in precision agriculture, which is something we don't have in our curriculum back home," Shughart said. Northwest began its partnership with AgriVision Equipment in 2015 to enhance the profession-based experiences agriculture students receive at the University and in the region. AgriVision Equipment proactively collaborates with Northwest by participating in its Career Day and Mock Interview Days, and its employees serve on advisory committees. "When we started talking about precision agriculture and where it�s headed, some things that we talked about three years ago are now happening," Barr said. "With this growth and the expertise that they have and they put forth, we're truly appreciative of their time and their financial support of this academy." 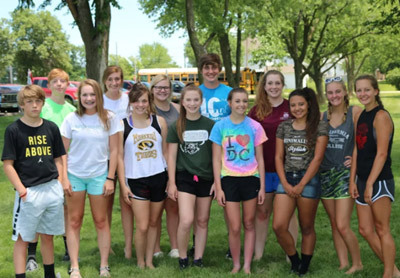 24 students were selected from Missouri and Iowa to attend the Precision Ag Academy developed in partnership by Northwest Missouri State University and AgriVision Equipment Group. Chillicothe FFA members Sam Meservey and Clayton Walker participated in the Academy this year. About the School of Agricultural Sciences - Northwest's School of Agricultural Sciences is experiencing rapid growth and serves about 12 percent of the University's undergraduate population. The School offers facilities such the 448-acre R.T. Wright Farm - which is home to beef, swine, dairy and sheep enterprises as well as row and forage crops - a horticulture complex and applied research and demonstration plots that provide students with hands-on, profession-based experience. The School, which is headquartered in the Dean L. Hubbard Center for Innovation, also places about 95 percent of its bachelor's degree earners into employment or continued education within six months of graduation. Additionally, Northwest and the School are in the planning stages and pursuing private support to help fund an $8.5 million, 29,000-square-foot Agricultural Learning Center at the Wright Farm to supplement and enhance the academic curriculum. The School offers agricultural majors in agricultural business, agricultural education, agricultural science, agronomy, animal science, animal science-pre vet and horticulture in addition to minors, a two-year farm operations certificate and master's programs in agriculture, education and economics. 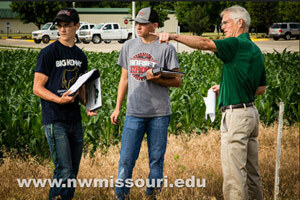 For more information, contact the School of Agricultural Sciences at 660.562.1155 or visit www.nwmissouri.edu/ag/. HONOR - the word has a tremendous meaning, especially to those have sacrificed and whom honor has been deemed worthy. The Veterans of our branches of military have definitely earned the right to be honored for their service to the citizens of our country. The Chillicothe FFA members understand honor; and in an effort to show their appreciation, have contributed many hours of labor and the proceeds toward honoring Veterans through the Central Missouri Honor Flight Program. The fundraising effort joined the Chillicothe High School Leadership Classes event of the Red, White and Blue 5K led by Hayden Montgomery. The combined effort of both groups developed from the Veterans Day Program realized almost $6,000 in a donation check presented by Hayden Montgomery and Garrett Cramer towards sending WW II, Korea and Vietnam Veterans on an amazing trip to Washington D.C. The Central Missouri Honor Flight is planning its 53rd Flight to honor our Veterans on July 5th. If you are a veteran who would like a spot on a future Honor Flight, or a caring individual interested in lending a hand, please visit the website centralmissourihonorflight.com for an application or to learn more. Hayden Montgomery and Garrett Cramer present the Central Missouri Honor Flight with a donation check of almost $6,000 on June 17 at the Columbia Courtyard by Marriott Hotel. 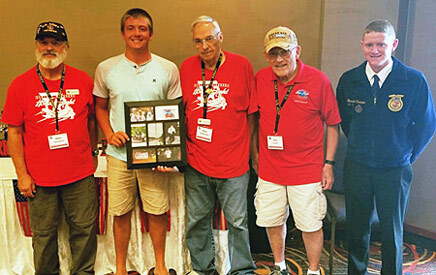 Pictured to the right are Honor Flight representatives along with Hayden Montgomery and Garrett Cramer. 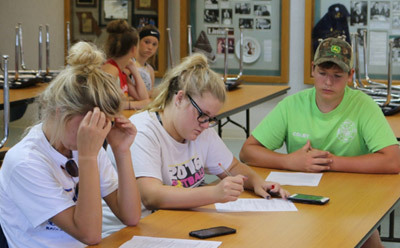 The Chillicothe FFA Assistant Officer Team converged on The Litton Ag Center on Wednesday, June 13, for a retreat to plan activities for the 2018-19 school year. The baseball-themed workshop, led by Katelyn Galloway (Litton Center Summer Intern), focused on developing and writing chapter goals for several activities throughout the year. After completing the workshop, officers enjoyed dinner together on their way to learn more about leadership and communication by watching the Kansas City Royals baseball team. The Retreat was successful with the Assistant Officer Team developing stronger communication skills and strengthening their bond through this activity. They are eagerly looking forward to a successful year as Assistant Officers. In attendance were officers Seth Hansen, Trace Rardon, Lucas Campbell, Mason Baxter, Tucker Burtch, Chloe Funk, Colby Gillespie. On June 3, 2018, the Chillicothe FFA Chapter members met for their June FFA Meeting. The meeting was held at the Mudcat's baseball game held at Shaffer Park. The 65 members in attendance held a tailgate before the game then enjoyed watching the Mudcat's win their home game. Chillicothe FFA President Garrett Cramer threw out the first pitch of the game. 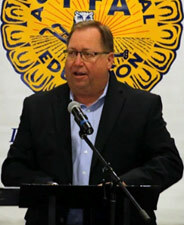 The purpose of the June FFA meeting was to promote fellowship among the members. On June 5, 2018, youth from Livingston County began their work at the Litton Agri-Science Learning Center. The Litton Agri-Science Learning Center was designed for the youth of Livingston County to learn more about agriculture as well as house their 4-H and FFA projects. In exchange for housing their projects there, the youth assist in the care and maintenance of the Litton Ag Campus. Local youth sign a contract that states they will provide care for their animal and help maintain the Litton Ag Campus grounds. In exchange, they are allowed to use the facilities and livestock equipment. In the picture, local youth are going over their contracts and learning what duties are expected of them. Most of the livestock will be housed at the Litton Ag Campus from early April to late August. This allows the youth to participate in local, state, and national livestock shows. This year at the Litton Agriculture Campus, there are 46 market hogs, 1 breeding goat, and 7 cattle owned by 31 Livingston County youth. On June 1, 2018, the Chillicothe FFA participated in the Area II FFA Sports Day in Cameron, MO with 14 members. 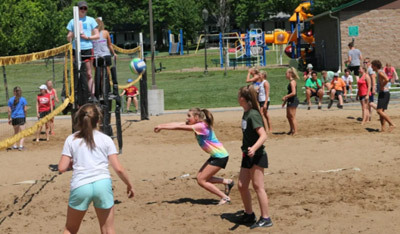 This sand volleyball tournament represents a reward for members as well as a time for fellowship. There were approximately 215 area members present and everyone seemed to enjoy the day. 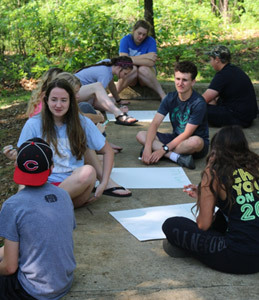 On May 23-24, 2018, the Chillicothe FFA Officer teams had their annual officer retreat, this year at Long Branch State Park in Macon, MO. The retreat focused on activities planning, communication skills, teamwork, and leadership. The officer teams set goals, planned activities for the chapter, worked on team building skills, and had a little fun. The officers had some time on the lake as well. When the work was over the officers enjoyed swimming at the lake, having some good fun around the camp fire. All in all the officers enjoyed their time together and have some new and fun events planned for the year. Chillicothe FFA Officer Teams attend the LEAD conference on May 30, 2018. Over 1200 local Chapter FFA officers and 200 chapter officers and advisors attended the annual LEAD training held at the NCMC campus in Trenton, MO. The LEAD (Learn, Educate, Advance, and Develop) training is designed to help prepare each officer team for their term of service for the 2018-2019 school year. 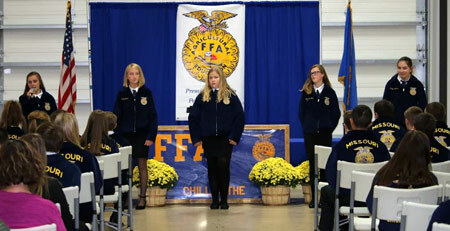 The officers were provided team-building and bonding opportunities, the opportunity to increase their knowledge about advocating for agriculture and agricultural education, work on their chapters Program of Activities, given guidelines for leading a chapter meeting, and helped with planning an FFA event. They also had the opportunity to attend breakout sessions on leading a meeting, planning events, and more in-depth knowledge on advocating. The choice to become active team members and make a positive difference in the lives of local FFA members, school and community was evident at each site. These conferences are sponsored by the Missouri FFA Leadership Fund. The facilitators consisted of past state officers; and they were divided into a north and a south team. The trainings were held at eight different locations throughout the state. Through interactive workshops, the facilitators encouraged the officer teams to reach outside their comfort zone to provide leadership opportunities for their local chapters. The FFA is a national youth organization of over 620,000 student members preparing for leadership and careers in the science, business and technology of agriculture with 343 chapters and more than 25,800 members in Missouri. The FFA strives to make a positive difference in the lives of students by developing their potential for premier leadership, personal growth and career success through agricultural education. On May 12 and 13, 2018, the Litton Agriculture Campus-MW Jenkins Expo Building hosted three swine shows and three lamb shows. Approximately 1060 head of hogs were shown during the two-day event and 224 head of lambs. On Saturday morning, the Wolf Showpig Bonanza was sponsored by the Chillicothe FFA Alumni with 420 head of hogs at the show. The sponsors were Platinum Sponsor - Show Stock Outfitters; Gold Sponsors - American Family Insurance - JR Reid Agent (Concordia, Sweet Springs, and Sedalia), BTC Bank, Chillicothe Area Chamber of Commerce, Chillicothe State Bank, Chula Farmers Coop, FCS Financial Group - Mitzi Winder, Genter Show Stock, Grand River Technical School - Jayme Caughron, Director and Adam Wolf, Assistant Director, Hutchinson & Company, Investors Community Bank, Lance Martin Show Pigs, Rafter C Online Auctions, Sydenstricker John Deere Chillicothe, Wolf Brothers, Wolf Farms, Woodworth Manufacturing; Silver Sponsors - Copeland Development & Construction, DQ Precision Planting & Tillage, Fairfield Inn & Suites by Marriott Chillicothe, Farm Bureau Insurance Joe Neptune, Farmers Electric Cooperative, GFG Ag Services, LLC., H.E. Smith Company, Hinnen Hauling & Construction, LLC., Remington & Riggin Isaacs, Rusty Black MO State Representative, Trans Ova Genetics; Bronze Sponsors - Butterfield's Grain & Associates, Inc., Chillicothe Animal Hospital, Chuck's Pest Control, Curtis Show Pigs, Grand River Livestock Market, Jim's Welding & Construction, LLC., Price & Johnson Insurance, T&R Soil Service. The results of the show were Supreme Gilt went to Olivia Loges, Reserve Supreme Gilt went to Olivia Loges, 3rd Overall Gilt went to Remington Isaacs, 4th Overall Gilt went to Macy Johnson, and 5th Overall Gilt went to Bryce Romine. Supreme Barrow went to Brylee Williams, Reserve Supreme Barrow went to Garrett Wolf, 3rd Overall Barrow went to Alyssa Reed, 4th Overall Barrow went to Drew Jacobson, and 5th Overall Barrow went to Drew Jacobson. Showmanship results are Champion Novice Showmanship went to Truman Wilson, Reserve Novice Showmanship went to Rigging Isaacs, Runner-up Novice Showmanship went to Karsen Parrish, 4th Runner-up Novice Showmanship went to Waylon Nolting, 5th Runner-up Novice Showmanship went to Kalli Parrish; Champion Junior Showmanship went to Tyne Wilson, Reserve Junior Showmanship went to Callie Jennings, Runner-up Junior Showmanship went to Tate Mikus, 4th Runner-up Junior Showmanship went to Lydia Nolting, 5th Runner-up Junior Showmanship went to Clayton Jennings; Champion Intermediate Showmanship went to Tate Welch, Reserve Intermediate Showmanship went to Ryan Rounsavall, Runner-up Intermediate Showmanship went to Newt Hodge, 4th Runner-up Intermediate Showmanship went to Payden Nolting, 5th Runner-up Intermediate Showmanship went to Drew Welch; Champion Senior Showmanship went to Alyssa Reid, and Reserve Senior Showmanship went to Kaycee Vandiver, and Runner-up Senior Showmanship went to Zach Trout, 4th Runner-up Senior Showmanship went to Anna Kate Link, and 5th Runner-up Senior Showmanship went to Marlena Long. The Crossroads Classic hosted one swine show and one lamb show held on Sunday, May 13, 2018, with 320 head of swine and 60 head of lambs. The Princeton FFA Jackpot Show hosted one swine show on Sunday, May 13, 2018, with 320 head of swine. Two lamb shows - Missouri Club Lamb Futurity (approximately 60 head) and the Youth Lamb Show (approximately 104 head) - were held on May 12, 2018, were put on by the Missouri Lamb Breeders Associations.